A kidney stone is basically what it sounds like: a hard object that forms in your kidney. It starts out when certain chemicals in your urine start to crystallize. As they form, they attract more elements, growing larger and larger. These stones tend to be sharp and spiky, ranging in size from a grain of sand to a golf ball. Tiny ones may pass out through your urine without you even noticing but larger ones can get stuck, causing a backup of pee, which in turn causes swelling and pain. The sensation of something pointy scraping its way through your tender urethra is no joke-and there’s a solid chance you’ll experience one in your life, so listen up. One in 10 women will get at least one kidney stone in her lifetime, and every year kidney stones send more than half a million people to the ER, according to the National Kidney Foundation (NKF). Men are even less lucky, with one in five getting them. Even worse: Cases of kidney stones are on the rise with rates more than doubling over the past few decades. Why? One theory is that factors like high blood pressure, diabetes, and obesity have been found to increase your risk, per the NKF. But before you start freaking out at even the slightest pain, it’s important to know the majority of kidney stones can be prevented or managed by doing some very basic things, says S. Adam Ramin, M.D., a urologist and medical director of Urology Cancer Specialists in Los Angeles. Calcium oxalate: These are the most common type, forming when calcium binds to oxalate, a chemical compound, in your urine. There may be a genetic component, especially in people who get them repeatedly, but most of them can be attributed to dehydration or a diet high in foods containing oxalates, like leafy greens and coffee, says Ramin. 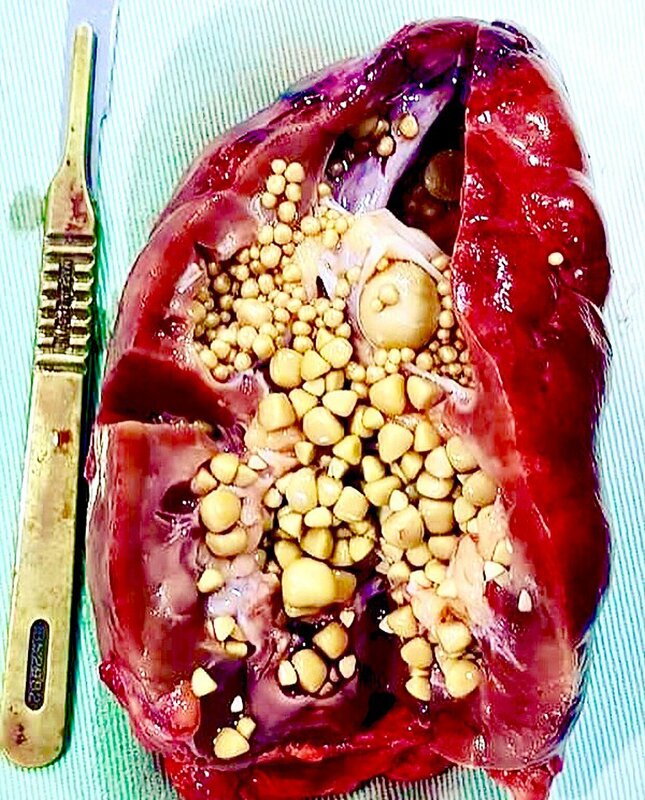 Uric acid: The second most common type, these stones happen when your body doesn’t process all the monosodium urate (a chemical commonly found in foods like animal protein and nuts) in your kidneys and it clumps together. These definitely have a genetic component and tend to run in families. Struvite: These stones are less common and are the result of an upper urinary tract infection, according to the NKF. Cystine: Caused by a rare genetic disorder called cystinuria, these stones form when a high amounts of the amino acid cystine leaks into your urine. They’re painful, for one-like, excruciatingly so. If a stone is just chilling in your kidney, you likely won’t even know it’s there, which is cool since doctors don’t usually treat those anyhow, says Ramin. However, once the stone moves down into your ureter (the little tube that funnels your pee from your kidneys to your bladder) it can block urine from passing, which causes swelling and serious pain, he explains. The longer it’s there, the more pain you’ll be in. You’ll likely feel it the most in your lower back, although some people may experience pain in their groin or abdomen as well, he adds. Other possible symptoms include nausea, vomiting, and fainting; and urine that is bloody, cloudy, or bad smelling. Kidney stones can sometimes occur with an infection which may cause symptoms like a fever, body aches, fatigue, and chills, according to the U.S. National Library of Medicine. How are kidney stones diagnosed-and treated? Often it’s pretty apparent by the location and level of pain a person is in that a kidney stone is the issue but your doc may order a CT scan or an x-ray to determine the exact shape, size, and location. You may also receive a urine test to check for signs of infection. Stones less than seven millimeters are generally left alone and given a chance to pass-that means you’re left to your own devices with patience and pain killers as you wait for it to flush out of your system. There are some medications your doctor can give you to help relax your ureter, making it easier for the stone to pass, says Ramin. Larger stones, however, may be candidates for surgery, like shockwave treatment, for example (when special sound waves are aimed at your body to break up the stone in to smaller, easier to pass pieces). Another option is endoscopic surgery where the doctor will go into your kidney directly, using a laser to break up the stone into sand-sized particles or to remove the stone whole, with a basket, he says. Wait, you can prevent kidney stones? How? First and foremost, drink more water-it’s really that simple. “Staying well hydrated can help prevent kidney stones and keep existing stones from getting bigger,” says Ramin. “Drinking more water will dilute your urine, making it harder for stones of any type to form.” How much, exactly? He recommends drinking about two liters, or 70 ounces, of water every day. Likewise if your stone was made of uric acid, then you’ll likely be told to ditch high-urate foods like meats, seafood, and nuts, he adds. Overall, because lifestyles diseases like obesity, diabetes, and high blood pressure increase your risk of kidney stones, anything you can do to reduce those will help with kidney stones as well, says Ramin. That means cutting out processed junk foods and eating more fruits, vegetables, and whole grains (avoiding any specific foods your doctor advises against, per above) along with getting regular exercise and a good night’s sleep. “I never even thought about kidney stones until one morning I woke up at 5 a.m. in terrible pain. It hurt so bad it made me throw up. I made my boyfriend take me to the hospital because I seriously thought my appendix had burst. At first they thought I was an addict just trying to score some pain pills and tried to tell me to leave! But I insisted and after a CT scan, the doctors found a six millimeter (mm) stone lodged up there. They said it would pass on its own and sent me home with a prescription for morphine and some disposable strainers to pee in to catch the stone when it passed. It finally did two days later. They were the worst two days of my life. Ironically, when the stone actually came out, it barely hurt at all.” -Jennifer M.
“A year ago, I saw the doctor about a UTI and he ordered a scan. They didn’t find a stone causing the infection but they did find a small 2 mm stone in my left kidney. I got antibiotics for the UTI and they just told me to drink more water to get the stone to move. Two weeks ago I suddenly started experiencing random bursts of intense pain on my left side. Apparently the stone has grown bigger, to over 5 mm, and gotten lodged at the top of my ureter. They gave me a prescription for Percocet but I’ve almost run out and it still hasn’t come out. I’m just trying to tough it out to avoid asking for more meds, but my God, this is the worst.” -Laura P.
“I’m the kind of girl who normally never takes any medicine stronger than an Advil, so when I went to the ER begging for pain meds I knew something was seriously wrong with me. They asked me to rate my pain on a scale of one to 10 and all I remember is screaming ’10.’ When the nurse gave me a funny look, I yelled, ‘I’m not exaggerating! Have you ever had this kind of pain before? !’ and she looked me and just said ‘kidney stone.’ She was so right. Because mine was so big, I had to have it broken up with a laser. That was when I was 24. It’s been five years since then and I’ve passed four more stones. Apparently this is just how my body works.” -Angelina A.